Turret punch presses have long faced a challenge: setup time. Obstacles to rapid setup have held back this technology from meeting its full potential. The problem has even led to more rapid adoption of pressroom technologies such as laser cutters. But these days turret punch presses ramp up quickly to full production, and offer the ability to monitor performance, thus allowing the machines to become production juggernauts. The latest turret punch presses employ features to ease setup and ensure continuing production. 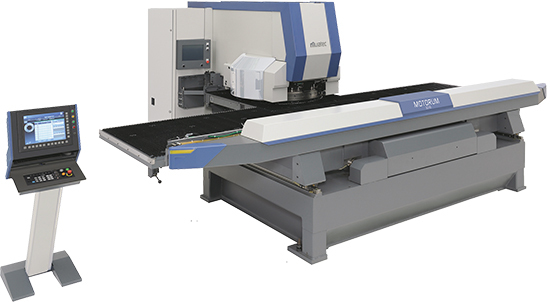 For example, the human-machine interface on this Motorum 33-ton machine from Muratec USA assists the operator with tooling selection, program scheduling and more. That’s the take from Donald Angel, lead applications engineer from Muratec Machinery USA, Inc., Charlotte, NC. MetalForming recently discussed turret-press setup and productivity improvements with Angel, and he offers insight into the whys and hows of their improvement. “The biggest challenge with turret punch presses has always been keeping them running,” Angel says. “That is one reason why lasers became so popular; no tool setup save for some nozzles and some other minor things, but in general, lasers would run longer and require less setup time. This screenshot shows process time, standby time and alarm time on a particular machine, allowing management to develop a plan to target problem areas and improve production levels. Facing this, equipment suppliers have sought solutions to allow job shops to better manage setup, thus enabling more green-light time on the machines. For example, Angel notes, Muratec has integrated software into the turret press’ control that routes to the customer’s network. Arrangements such as these allow programs to transfer to machine controls simply, rapidly feeding tool info, material, work-order information and more, all of which can be quickly accessed by operators. Beyond minimizing time needed for setup, the ability to automatically program a turret punch press and place job, part and tool information directly in front of the operator reduces the likelihood of errors. This screenshot of process time—when the machine is running—enables a broad view of machine capacity levels and production trends, and with multiple machines, allows better load balancing across the shop. With machine setup and tool monitoring now automated and streamlined, turret punch presses spend more time producing good parts rather than sitting idle or churning out scrap. But there’s more. Today’s machines can be monitored accurately and easily, enabling management to better plan production. Numbers don’t lie, and new-generation machines provide the ability to accurately gauge machine productivity. “Software can analyze information from the machine control, such as when it’s running, when it’s off, and when alarms occurred and why, then crunch those numbers to create useful, manageable data,” Angel says, detailing one such system, Muratec’s ProcessNet. “Management can track that and analyze trends over weeks and months, or identify the common alarms, and from that then target areas for production improvement. Or, a snapshot can indicate what machines are down and why. See also: Muratec Murata Machinery USA, Inc.